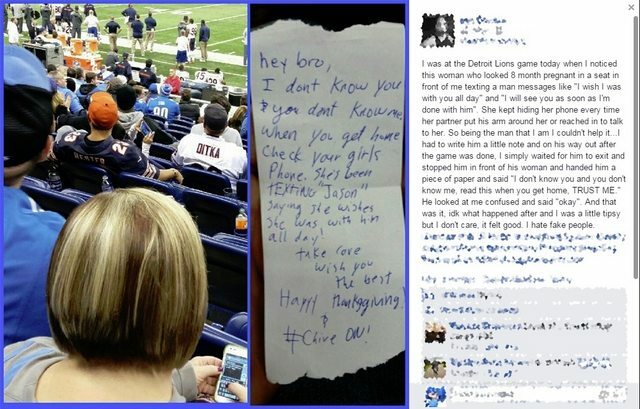 What would you do if you saw a pregnant lady cuddling with a guy at a Lions game and romantically texting another guy when he walked away? Well, one man wasn't about to let her dirty little secret stay a secret anymore. This has been floating around the internet for a few weeks now (as evidenced by the Lions-Bears game in the background, which took place on Thanksgiving), but we still thought it was worth sharing. I mean, I hadn't seen it until today and I spend at least eight hours a day on the interwebs. I think this guy did the right thing by leaving the stranger a note that outs his pregnant girlfriend (or wife -- that's not clear) as a cheater. It's better to find out that you might need a paternity test early than to find out on the kid's 18th birthday. I hope that I would have the cajones to do the same thing in this situation.